Headquartered in Omaha, Lyman-Richey Corporation, A CRH Company, employs nearly 800 people in its eight aggregate and concrete companies across central and eastern Nebraska and western Iowa. Lyman-Richey Corporation has been providing top-quality construction materials and superior service to customers and contractors in the region for more than 130 years. An Environmental Manager is responsible for monitoring and ensuring the company’s compliance with all Federal, State and Local environmental regulations, rules and guidelines. Works across all company departments to provide subject matter expert leadership for all environmental matters. Monitor and provide assistance to facility and senior management with plant inspections to ensure environmental compliance. Conduct compliance reviews, inspections and internal audits to ensure adherence with all applicable environmental permits, rules and regulations. Obtain all environmental permits required for company plants, sites, projects and assist Real Estate Manager with USACOE 404 permits for wetland mitigaton. Ensure all compliance or monitoring tests, are conducted in accordance with timeframes outlined in environmental operation permits. Maintain documentation compliance activities such as inspections, audits, complaints and investigations. Inform internal field employees, managers and outside contractors of company environmental policy, best practices and compliance requirements. Provide educational events and training to all company employees on environmental issues and responsibilities. Assists facility managers with environmental compliance issues including wastewater permitting, air permitting and storm water permitting. Includes report preparation. Participate in environmental education and research. Report all violations of environmental permits, rules and regulations to company management personnel and, when required by operational permits, to duly authorized regulatory agencies. Prepare Tier II, Form R, Stormwater, Air Permit, Oil Tank Inspection and SPCC plans and reports. Keep informed regarding changes to environmental legislation, trends and best practices and assess the potential impact these changes will have on company operations. Lead implementation of compliance related policies and procedures throughout the company. Review required documentation at all sites, projects and plants to ensure ongoing compliance. Advise field and middle managers on use of any environmental compliance or reporting tools which are available for them to use. Direct the development and management of environmental related plans and requirements. Develop and implement environmental compliance plans for programs such as air quality, storm water discharges, oil spill prevention or control, recycling, managing hazardous materials, employee education and so on. Work with consultants to ocassionly develop any needed grading permits. This would include coordinating the required mornitoring of such permits. Responsible for submitting any and all environmental reports required by any permit, including coordination and completion of CRH Annual Environment Report. Work with consultants and other CRH personnel as needed to successfully meet the requirements of this role. Work remotely on occasion when traveling to plants and facilities. Direct all activities focused on environmental compliance. File all compliance or annual report required by regulatory agencies, meeting all applicable deadlines. Carry out all assigned tasks and projects in a timely manner. Maintain a positive and helpful attitude. Bachelor’s degree in Environmental studies or related field is preferred. Two or more years of experience in environmental field is required. The ability to effectively present to different size groups and audience types is essential. Display a professional and courteous attitude to co-workers, supervisors, and the public always. Working knowledge of computer use and associated computer programs, should be proficient with the MS Office Suite (Word, Excel, PowerPoint and Outlook). Analytical ability and process improvement knowledge. Ability to read and interpret technical documents and regulations. Ability to develop and foster relationships and trust at all levels of the organization. Work is a combination of office, plant and field work, and occasionally requires walking, climbing, bending, pushing, pulling, and lifting (50 lb. minimum) objects. Able to stand, use hands and fingers to manipulate objects, talk and hear. Job hazards may include exposure to dust, noise, fumes, and all-weather conditions. Potential for serious injury exists if equipment is misused or safety precautions are not followed. The noise level in some areas of the work environment may be loud but typically the noise level will be moderate. 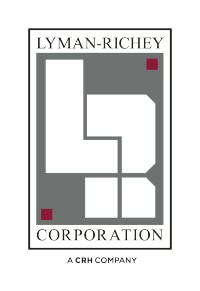 Lyman-Richey Corporation, A CRH Company, is an Affirmative Action and Equal Opportunity Employer.